Equities start the day flat, how about that? Equities start the day flat, how about that? What’s up everyone, how you feeling…Good? Great? Awesome? I’m feeling large and in charge, not only because of my weight but because of how good this market seems to be doing. 2,801 on Friday, which was the 4th consecutive defense of the dreaded 2.800 level, with breadth expanding and macro data staying firm. Let’s go!! You know I see a lot of people on $TWTR wondering why the market seems to be doing so well. They say things like “but the tweets and the tariffs and the trade wars and the yield curve” blah blah blah. Guess what, those things are waves crashing against the ship. They look ominous and scary but ultimately die harmlessly against the U.S.S. America. You know what you should be more concerned with other than the deadly effects of sugar on your body? Our motor underneath the waves which, as of now, continues to chug along like a champ. 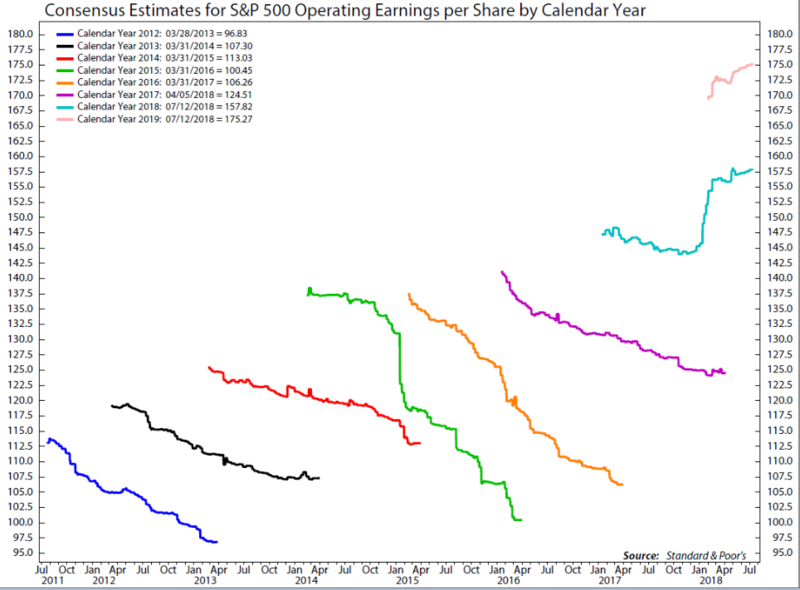 Check this quote from Bloomberg: “It’s early, but the consistency of earnings beats have been nothing short of spectacular as of last week, 95% of the 86 companies in the S&P 500 that have reported results topped EPS expectations -- JPM points out that out of the results so far, the stock reaction to the beats is the best in two years while we’re also seeing the second best quarterly guidance outlook in five years (67% of companies have revised earnings forecasts higher).” Earnings people…earnings…the thing that actually moves stock markets over the long run. 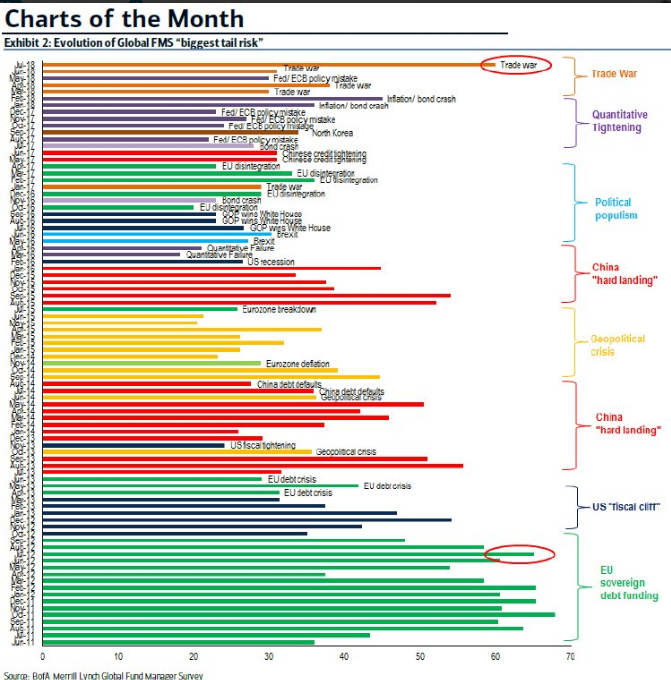 How about this chart from Ned Davis…analysts are actually RAISING forecasts which never happens. Look, history will absorb and forget the tweets / policy mistakes / nonsense but earnings will always matter. We get 171 S&P reports this week, 75 on Thursday, so stay tuned to this channel for rigorous analysis of EPS, guidance, CEOs blaming random things for their miss, and why you should always use a pinch of salt in your coffee grounds. Let’s see what happened today. After the open we had a nice quiet summer Monday rally driven by Financial and tech. Treasury yields were higher and the curve steepened to a I asked a fixed income buddy of mine why. Here was his response: “potential BoJ policy shift, Trump politicizing the Fed, and curve flattening trade unwinds from Hedge Funds”. Oooookkkkkkkkk, let’s try and put that in layman’s terms shall we? A central bank across the Pacific might be changing monetary policy, that one is easy enough. Trump seems hellbent on bashing the Fed for raising interest rates. Ok, I get that one too, hiking rates could slow economic growth and clearly a President wouldn’t want that. Lastly there are people who bet on the shape of the interest rate curve and they are changing their minds. Whatever, who the heck wants to do that, let’s talk about stocks because I’m about to fall asleep with this Fixed income nonsense. Dear FI people at Baird: #ZZZZ. Banks like higher yields so yea, they led all names. HAS gained 13% because I guess people just realized you can still buy toys even after Toys R Us went under. Who knew? All that being said the biggest single winner was LPNT, up 35% because apparently Apollo wanted to buy some rural Hospitals. Losers were PETS -11% (are there any stocks with Pets in their name that do well? ), PZZA -10% (yea..umm), HAL -8%, ITW -7% (this one bums me out, I don’t like to see industrial bellwethers struggle), and TSLA -3.3% because apparently the company might ask for money back from its suppliers (we rate Outperform). By lunch we were near the highs, 2,806 up 15bps. Succinct Summation of the Day’s events: Quiet summer Monday but the grind continues higher based on a strong start to earnings. This seems like a dubious claim but let’s run with it for sarcasm sake: 70% of millennials regret buying their homes. Ok, that’s probably high, but how about this quote: “One in five said they were frustrated by damages they found after moving in, while others said they discovered the house didn't end up working well for their family.” So they’re like the rest of us? Great. Guess what, everyone who buys a home finds things they don’t like about it after moving in. There is no magic perfect hand crafted artisanal home with the perfect layout, amenities, and free from all kinds of “lived in” damage. That stuff only exists on HGTV. Stop it, they are just like all of us. So it turns out there are college that will forgo tuition if you give them a stake in your future earnings. Intresting….is this asymmetric? Do they participate in the downside too? How hard is it to become a 401k millionaire by age 65? Ben Carlson runs some numbers here. You know what strikes me after looking at the first chart? It doesn’t seem hard from a numbers point of view (you only need the historical avg mkt return even starting from ZERO at age 45) but it is hard from a behavioral / real life point of view. Wanna know what the Wall of Worry has looked like since 2011? Here you go (great slide for my FAs to show clients. There’s always a worry. You know the economy is late stage when companies start selling $375 freshly brewed coffee alarm clocks. We’ll end tonight on the craziest magic trick I’ve ever seen. I don’t get how it works but I do know I’ve never seen Han Solo swear so that’s cool in and of itself.